There are plenty of places to enjoy fresh-picked fun in Cumberland Valley. We&apos;ve outlined a few options for a half day, full day or an entire weekend. Find even more places to explore by viewing our Local Food, Farm & Outdoor Attractions Guide. Start your fresh-picked fun weekend by picking your own fruits and flowers, and browsing locally grown foods at the assortment of farmers markets in Mechanicsburg. 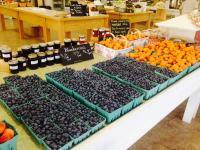 Start a fresh-picked fun weekend at Paulus Farm Market in Mechanicsburg. This market is known for their U-pick flowers and pumpkins. Pick a wonderful bouquet for an amazing price! Paulus is also a great place to bring the kids. In the warm months, kids can climb on the wooden tractor and wagon, visit with barnyard animals and swing on a horse tire. In the fall, they can enjoy a mini-straw maze, corn and soybean boxes and a slide and climb area. You could also start your day at the West Shore Farmers Market in Lemoyne. This 60,000 sq. ft. farmer&apos;s market and boutiques district offers all the local food goodies and adds a bonus of an upstairs shopping center! The first floor farmers market features finds like gourmet coffee, fresh fruits and vegetables, meats and cheeses, seafood, ready-to-eat meals, desserts and doggie treats. The upstairs includes specialty stores that offer baby clothes, home décor, designer jeans, upscale jewelry and more. You could spend an entire morning shopping and eating your way through the market. Still looking for more fresh-picked fun? Add one of our options below for a full day of exploring. After exploring Mechanicsburg or Lemoyne, head to Carlisle and visit the world&apos;s largest gourd-crafting company. Meadowbrooke Gourds is a working farm that showcases the gourd making process from seed to final work-of-art. Pick out a unique piece for your home or stop by on the right day to select and paint your own gourd. After shopping at Meadowbrooke, visit Clair&apos;s Orchard on the Holly Pike for quality fruits like apples, peaches, nectarines, cherries, pears, plums and more. You can also find fresh apple cider, locally-grown vegetables, meat and dairy products and homestyle canned goods. If you&apos;re visiting Carlisle on a Wednesday, head downtown to the intersection of High and Hanover streets for Farmers on the Square. This farmer-run, seasonal market features vendors within a 50 mile radius of Carlisle. Located in nearby Dillsburg, Paulus Orchards offers a farm stand with fresh-grown produce along with baked goods, honey and maple products, and U-Pick options. Family-fun experiences in the summer and fall include over 20 attractions in the Paulus PlayLand. Highlights include pedal karts, rope webs, rubber duck races, swings, tube slides and more. If you are traveling with the kids extend your agricultural trip with a stop at nearby Starry Night Alpaca Farm to visit with and learn all about the beautiful alpacas. The whole family will also enjoy shopping for fresh produce at Peters Orchard in Gardners. Outdoorsy families will enjoy biking or walking along the Cumberland Valley Rail Trail. This relaxing, flat, 11-mile trail features informative signage explaining area agriculture and Civil War history as it relates to this historic trail. I f it’s an adults-only weekend, extend your trip with a visit to the Valley’s surrounding wineries. Stay in the conveniently located Cumberland Valley and branch out to Gettysburg to visit Hauser Estate Winery, Adams County Winery and Reid’s Orchard and Winery. You can also travel across the Susquehanna River to the state&apos;s capital, Harrisburg and nearby Hershey. Visit The Vineyard and Brewery at Hershey for beautiful views of the grapes and fun summer concerts. Find even more fresh-picked fun at our seasonal markets and unique agricultural events.